The state pollution control board has confirmed that the Kamarajar Port’s new yard is infringing on the Ennore creek and hence ordered to remove it. CHENNAI: While so far only the activists have complained that Kamarajar Port is encroaching on water bodies at Ennore, Tamil Nadu Pollution Control Board has now confirmed that the port’s new yard is infringing on the Ennore creak and directed to remove it. The District Environmental Engineer in Ambattur had inspected the area acting up on a complaint filed by K Saravanan of the Coastal Resource Centre (CRC). The inspection revealed that the port had been converting the Creek's tidal wetland area in Athipattu village into dumping ground for dredged material. 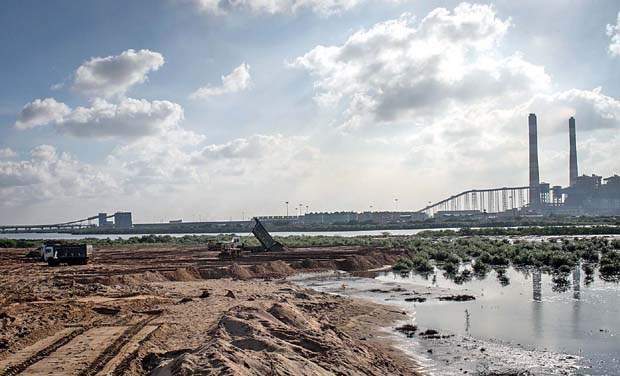 The complaint by Saravanan noted, "the ongoing violation includes transport of dredged material through heavy vehicles on CRZ areas and dumping the mud to form a large bund. Contractors employed by Kamarajar Port Limited were seen dumping material to make bunds on 17th May 2017." The Ennore creek is a swampy backwater that is spread across 13 km near the Kosathalayar river. While the creek is home to a vast aquatic ecosystem, it also provides livelihood to at least six fishing hamlets. The creek that was said to be a touristic marvel during colonial times is now filled with the port, power stations and industries that pollute the area. In 1996, it was given the highest protection possible by declaring it CRZ 1 (Ecologically Sensitive) under the CRZ Notification by way of a GoI-approved Coastal Zone Management Plan. However the port is trying to convert the creek into land for real estate, alleged CRC and 'Save Ennore Creek Campaign'. "The port's strategy is simple – violate first, regulate later," said Saravanan, who is also a local fisher rights activist. "Kamarajar Port ltd masterplan document reveals that the new coal yard is part of a plan to convert 1300 acres of the Creek into industrial real estate," the campaigners said in a press release on Monday, adding that further encroachment was stopped only after fisherfolk physically blocked the port's earthmovers. However, the port continued to violate several parts of the creek. Reacting to the directive, the port officials said that the debris dumped in the creek will be removed within 15 days. A senior official from the port however argued that the bund wall was not built in the CRZ area. "The bund does not encroach the CRZ line and we will soon fill it up," he said adding that the structure is being built with the clearance of the National Green tribunal. Environment activist Nityanand Jayarman who has worked extensively to conserve the creek, charged that the port is relying on a map that is not approved by the government. "The only map approved by the government shows that the bund is built in the CRZ area. The map used by the port is not approved," he said. The port relies on a map generated by researches from Anna University in 2011. “Unless the state government arrests further encroachment and acts urgently to restore the Creek, Chennai will end up in a watery grave the next time heavy rains fall,” Jayaraman said.